Limonene is the second most common terpene in nature and a prominent terpene in cannabis. The fragrance of citrus fruit peels is comprised mostly of limonene, so you’d be correct to assume that this terpene takes its name from the lemon. Limonene’s pleasant odor has made it a common additive in perfumes and food. Limonene can be safely consumed in high, naturally-occurring, amounts. However, adverse effects may be felt at doses around one gram per kilogram of body weight (around 68 grams of limonene for a 150-pound person). While this is significantly higher than what you’d find in cannabis flower or cannabis products, limonene extract can be purchased as a dietary supplement, so it’s advised that you consult a physician before adding substantial amounts of limonene to your diet. As with many terpenes, plants produce limonene to help protect them against harmful microbes, and its antibacterial and antioxidant effects have been well-documented. But beyond its abilities to protect the plant, it also has an impact on brain function that scientists are working to better understand for the treatment of a variety of ailments—namely anxiety and other mental health disorders. Studies have found that both orally consumed limonene and inhaledlimonene vapor reduces anxiety in lab mice. Similarly, limonene also reduced obsessive compulsive disorder-like behavior (OCD). However, limonene’s effectiveness seems to depend on mouse strain or type of anxiety test administered, perhaps indicating that its anxiety-reducing effects may work in some but not others. Inhalation of limonene vapor increases serotonin and dopamine levels in key regions of the brain that are associated with anxiety, depression, and OCD. Limonene may also have antidepressant qualities. Few human studies have been conducted on limonene’s antidepressant effects, but one small studyof 12 hospitalized patients with depression revealed promising results. Limonene vapor inhalation reduced the need for antidepressant medication in 9 of the patients, normalized stress hormone levels, and improved immune function. It remains unclear how limonene achieves these therapeutic effects. Inhalation of limonene vapor increases serotonin and dopamine levels in key regions of the brain that are associated with anxiety, depression, and OCD. At this point, it’s unclear how limonene boosts these brain chemical levels. Does limonene merely stimulate the brain’s olfactory system, or is it directly affecting brain cells, themselves? The actual mechanism is an area for future research, but it’s likely some combination of both stimulating the olfactory system and direct cellular action. Indicas vs. Sativas: Which Strains Have More Limonene? Do indicas or sativas tend to have higher levels of limonene than the other? 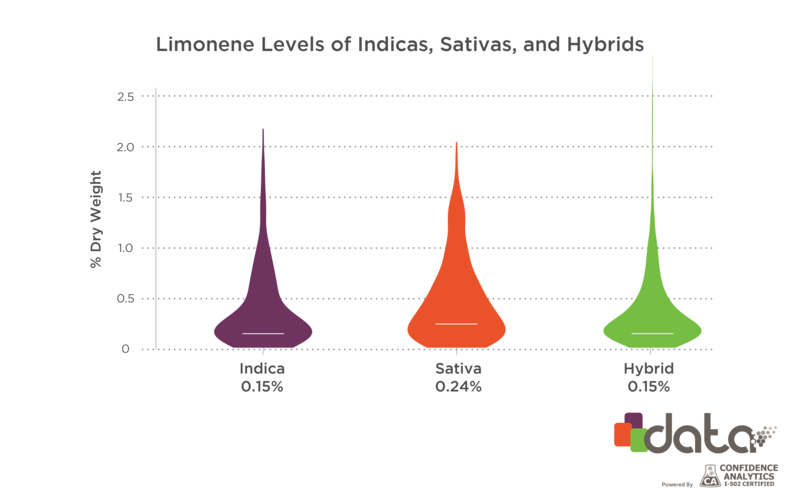 To investigate this, we looked at thousands of cannabis laboratory measurements and compared how limonene levels are distributed across cannabis flower products labelled as indica, hybrid, and sativa. On average, strains labelled as sativa tend to have higher levels of limonene, although there are plenty of strains labelled as indica and hybrid that have high levels of limonene. In fact, in this data set, the strain with the highest limonene levels on average was labelled as Hindu Kush, which is an indica (see below). 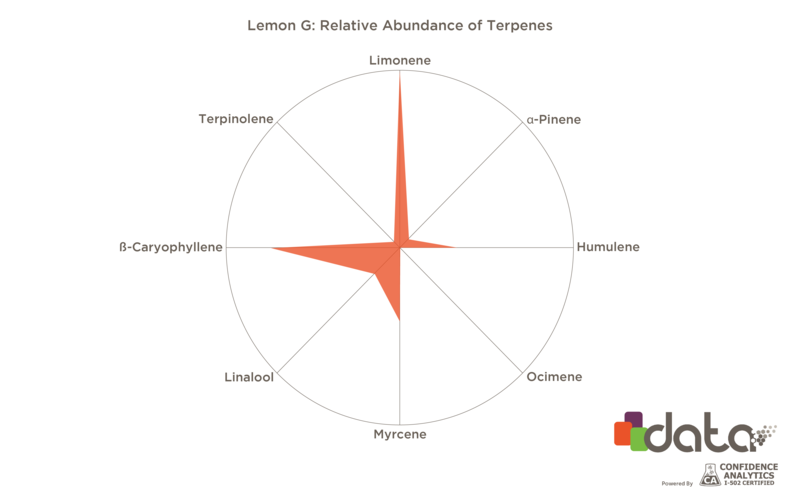 As with other cannabis terpenes, most samples contain less than 0.5% limonene by dry weight, but it’s possible that strains can have more than this. Flower samples with 1% or more limonene by dry weight are quite rare. 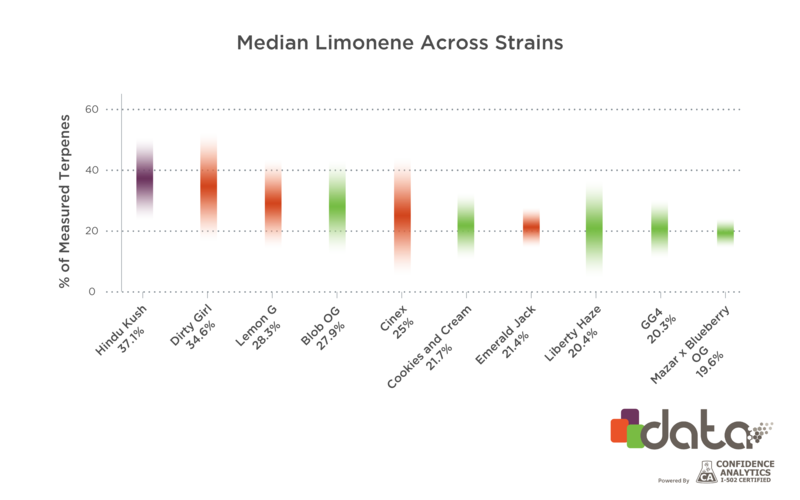 Which Cannabis Strains Tend to Have the Most Limonene? As with most terpenes, precise levels of limonene often vary a lot between strains and across samples of a single strain. For example, the strain Dirty Girl tends to have relatively high levels of limonene, but individual samples can be quite variable. Some samples display limonene levels as low as 20% of all measured terpenes, while others test at 40% or more (i.e. limonene represents 40% or more of measured terpenes). This variability is one reason why simply knowing the levels of one compound are not sufficient to understand the “essence” of a strain. You need to know the full profile of a strain. 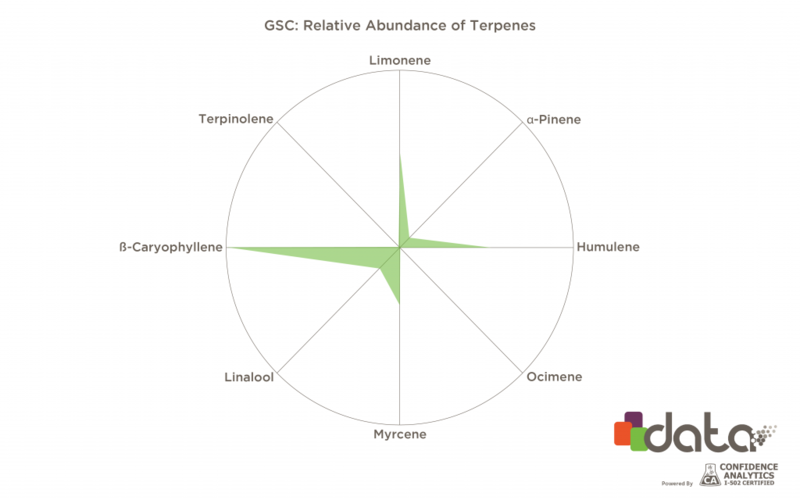 This becomes more clear when you begin to look at the full terpene profile of strains and compare one to another. 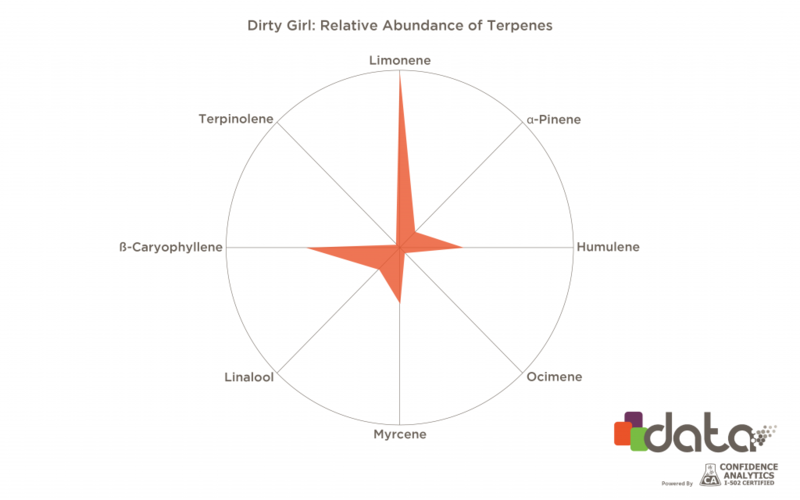 First let’s compare the terpene profiles of the two strains with the highest relative levels of limonene in this dataset: Hindu Kush and Dirty Girl. Despite the fact that Hindu Kush is an indica and Dirty Girl is a sativa, the data indicate that these strains can have very similar profiles. Next, consider a strain like Kosher Kush. Like Hindu Kush, it’s an indica, and both are “kush” type strains, so one might expect that they display similar terpene profiles. However, this is not the case. Strains labelled as Hindu Kush in this dataset are limonene-dominant, meaning they have higher levels of limonene compared to other terpenes. 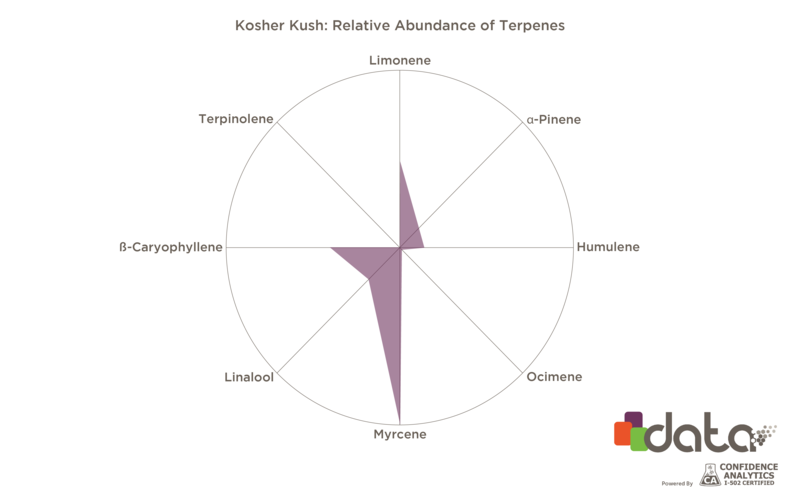 In contrast, Kosher Kush is myrcene-dominant. So, even though it has relatively high limonene levels, limonene is not its most prominent terpene. Another example of strains that appear to have relatively high limonene levels but are not limonene-dominant are Cookies strains. In this dataset, Cookies and Cream, Moon Cookies, and GSC all show up as strains with relatively high limonene levels, but each displays a caryophyllene-dominant terpene profile. Is Limonene Synonymous With Lemon Aroma or Flavor in Cannabis? The aroma that characterizes a strain is not due to one terpene, but rather a combination of all the terpenes that it contains. The aroma that characterizes a strain is not due to one terpene, but rather a combination of all the terpenes that it contains. One terpene in isolation will have a very different aroma from many terpenes present in combination, even if that combination contains a lot of one terpene. You can experience this first hand in certain dispensaries, many of which contain “terpene stations” that allow you to smell the aroma of individual terpenes. None of these smells all that much like cannabis flower, and the reason is that cannabis doesn’t contain just one terpene—it contains many. So, even though limonene is found in lemons, that doesn’t mean that the presence of limonene can fully explain the aroma of a strain, even if it gives off a citrus aroma. For example, consider the terpene profiles of Lemon G and Super Lemon Haze. Both have “Lemon” in the name, but only Lemon G is limonene-dominant. Super Lemon Haze doesn’t actually have a limonene-dominant terpene profile even though it’s named after its citrus aroma. 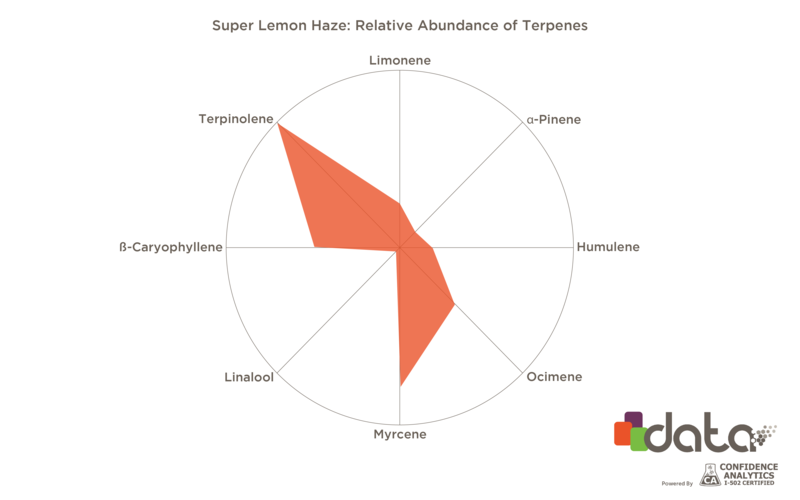 Super Lemon Haze is terpinolene-dominant, and can contain multiple terpenes at higher levels than limonene. So, knowing the name and even smelling the aroma of a strain may not be enough to tell you what it’s specific terpene profile is. The only way to know for sure what the terpene profile of a cannabis strain or product is is to have accurate lab testing results. Unfortunately, most states do not require cannabis products to get tested for terpene levels, and most brands do not provide this information on product labels. However, there are some cannabis brands that provide terpene profiles to consumers on product labels, and some retail locations are starting to carry these products more. If you’re interested in knowing the terpene profile of strain, ask your budtender if they carry any products with lab tested terpene profiles on the label.